My great great grandmother used to always sing the following rhyme: one two three, come with me, bring your dolly and have some tea. Just a memory for the day. 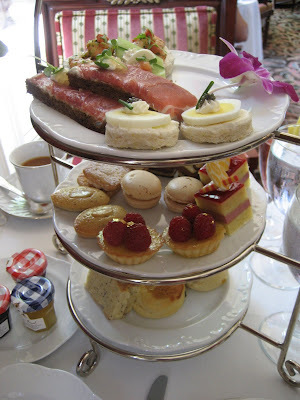 Call me naive, but way back in college when I was packing for my study abroad in London, I pictured having high tea at fancy places, but during my entire six months there, I barely even sipped tea in my flat never mind at a fancy tea place. I finally got the full British tea experience today though out here in California. During lunch my coworker and I traveled to The Langham Hotel & Spa in Pasadena, which in honor of their flagship property opening in London back on June 10, 1865, all of the Langham Hotels were celebrating the anniversary by having the timeless tradition of Afternoon Tea, offered at it's original price of one shilling, six pence (15 cents). 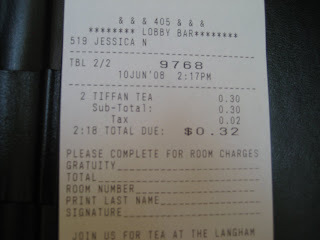 Normally $45.00, we got to have an elegant afternoon tea for only 15 cents each, the bill literally came to 32 cents (I took a picture to prove it), crazy. Besides the price I was especially delighted to see that their friendly staff was dressed in 19th century clothing--I wasn't expecting that. In the background there was a pianist playing classical music and show tunes like Sound of Music's Edelweiss. As for the hotel itself, it's stunning when you pull up. It looks like a bigger version of Mr. Darcy's mansion in the A&E presentation of Pride and Prejudice. Yes, I'm a romantic. wow...one look at the last photo and I hungry yes! Wow! What a great deal! 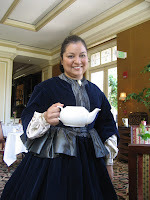 There is a little tea shop in Annapolis that I went to once and I really had a wonderful time. It was very relaxing. I'm so jealous. I love high tea. I try to go with my NM girlfriend whenever we get together, but he price tag always kills me. Looks like you had fun! Oh, I love afternoon tea. 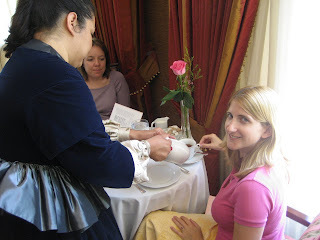 I partook of tea not in London, but in Ireland, which was much less formal and a whole helluva lot of fun ;). Yet, I want to try formal tea at some point and your photos look wonderful. my mom and my sister went there a week or so ago and loved it. looks like such a great time! and i love mini sandwiches, haha. Great post! My favorite party for my Little One was a tea party with all of her friends- ages 4 and 5. 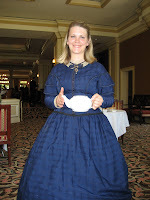 They were dressed in their finest and had petit fours, cucumber sandwiches, and of course tea! It was a smash, and fond memories were formed! Great post. I looooove high tea. 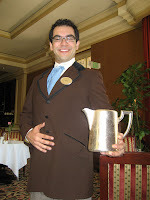 If you ever go to Victoria, BC you Must go to the Empress Hotel for their high tea.